The various layers both absorb and diffuse the sound waves hitting them, so progressively less of the original source acoustic energy passes through each layer. This reduces the amount of energy hitting un-treated walls and other surfaces so there is less of the original source reflected back as unwanted room ambience to the mic. The Reflexion Filter also helps prevent any reflected sound reaching the back and sides of the mic. Its shape and size have been carefully tested to maximize absorption while keeping ‘coloration’ down to only around 1dB, and leaving the microphone’s polar pattern unaffected. All in all, it’s a very clever and desirable piece of kit. 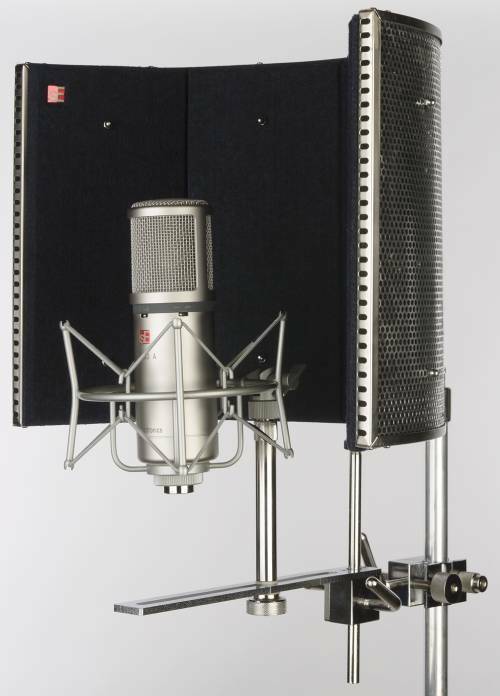 It allows you to record vocals, guitars etc with a ‘drier’ sound without having to have an acoustically treated room. It’s portable. It uses state of the art materials. It works… and it’s a fraction of the price of acoustically treating your studio environment!